Megfuzzle on LiveJournal was cool enough to review Take the Reins AND post a pic! 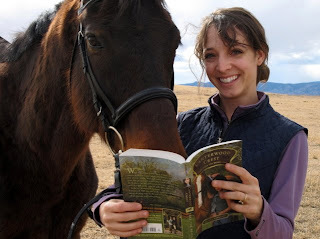 That's Mac, her horse, and he's reading TTR too. :) Love, love this pic. Yesterday, I traded my ancient, falling apart Gateway laptop for a pink (!) Sony. OMG. I'm in love with it. Have I mentioned that it's pink? Uh-huh. :) It's pink. I've been playing with it and transferring all of my stuff from one comp to the next. After today's phone interview, I think I've tapped all of the local press. I'm kind of glad to take a step back from that now and get back to my REAL job--writing. It had to go on the back burner while I did PR. Then again, going out on interviews broke up my crazy writing schedule and I've met a lot of cool people. I do think I got better (well, at least I hope so!) as the interviews went on. I felt less grilled and more as if I was talking to friends by the end. But things are settling down now and I'm trying to get back on track for book five. I won't have enough time to really figure out what "worked" PR-wise for TTR that I can shift over to CHASING BLUE, but I hope to be much better at PR when BEHIND THE BIT releases. I wonder how marketing will be different for CB. It comes out on March 24--just 8 weeks after TTR. So, obviously, I can't get the same newspapers and magazines to cover me so soon after January. I'm guessing I should start looking for different markets. Maybe let the bigger, statewide magazines know that local mags and newspapers have covered me and use those clips to get their attention. Hmmm. Seems like a phone call to Publicist Nicole will be necessary. :) She will have Answers. Tomorrow is my last day at Girls Horse Club! We've having so much fun over there and I love all of the girls! They're so smart and funny. If you're a young writer looking for writing advice, definitely check out the thread. Tomorrow, Sarah MacLean is here and she's answering questions about THE SEASON. Sarah's super awesome, so def check back for that. Aw, thanks so much for the shout out!! I can only imagine how hard it is to find time to write and do all your marketing too.